Okay, I promise this shall be the last baking post I'll do for this year. And the reason for this bake post is because of two new 'babies' I've bought on iherb. Raw cacao sweet nibs to replace our sugar (and fat) laden chocolate chips. And a 1:1 sugarless sugar replacement that supposedly bakes and tastes exactly like sugar. 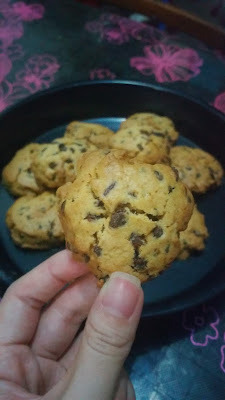 I've previously baked 1 batch of chocolate chip cookies following their 1:1 replacement instruction and also using semi-sweet hershey's chocolate chips and the result was... SUPER SWEET. So my advice to you is, do not follow the 1:1 replacement instruction. Start low, with about 50% reduction and then slowly work your way up if it's not sweet enough for you. You can get the sugarless sugar, cocoa nibs and other ingredients I've used HERE. The baking procedure is basic and standard. First up, cream your soften butter and sugars until pale and fluffy. Beat in your egg, honey and vanilla extract until well combined. Sift in all your dry ingredients and fold until just combined before adding in your cocoa nibs and folding your batter until the nibs are evenly distributed. Using a tablespoon, spoon the batter onto your baking sheet lined with parchment paper. If you're chilling your dough, the cookies will NOT spread at all hence you MUST flatten your cookies and you may position them closer together on your baking sheet. Chill your cookie dough (on the baking sheets) in the fridge until they're harden up and bake until they're beautifully browned on the surface. I can't advise you on your oven setting and baking time as I've baked them in my mum's air fryer/roaster, which works very differently from a conventional oven. Anyway, just FYI, I baked mine at 215 degree Celsius in the air fryer for 5 minutes first before cranking down the temperature to 180 degree Celsius for the next 25 minutes. The AF bakes much, much, muuccchhhh slower as compared to an oven (my oven broke down and I haven't gotten a new one) and based on past experience with my oven, the cookies should bake within 15 to 20 minutes (depending on how thin you've flatten them) at 170 - 180 degree Celsius in a conventional oven. 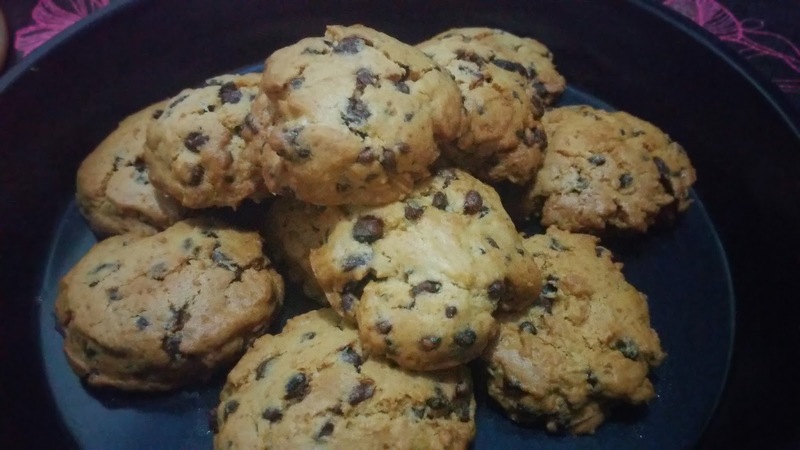 These cookies are crunchy throughout and kept their crunchiness over the days they lasted. Due to addition of cornstarch and top flour, they're slightly crumbly and tender, like a shortbread cookie. Contrary to those raves on iherb reviews, the nibs tasted sour with a weird, herbal aftertaste. It wasn't even the cocoa bitterness I enjoy in my dark chocolates. Texture wise, some were crunchy while some were overly crisp, somewhat crackly, and it made me feel as though I'm biting onto eggshells. So my conclusion is, unless you're really desperate to follow through with an extremely 'healthy diet' and absolutely need to find a healthy alternative, if not just stick to your good old chocolate chips, please! I wonder how sugarless sugar taste like though, but this will be great for people who celebrate christmas, can do some baking for the guest. Simple and nice. THanks for sharing. Thank you for the advice. Often, I would follow the carton as well especially if im baking first time. Anyway, our family loves cookies and anything sweet. And I find myself baking these cookies as well. We all love to munch something as we watch movies or just sit. Ihihi. 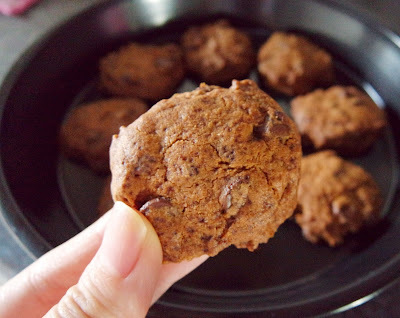 I am not really into baking, but definitely I am into eating chocolate cookies. My children and I just love to eat chocolate-based products. Anyway, this one looks cool. I like the fact that it is healthy! Sometimes you have to sacrifice something in order to gain another thing. In this case, the taste in exchange for health. LOL. Life is never fair, isn't it. But I think it could also be the brand. Perhaps you could find another healthy alternative that tastes better for you...? Nooooo! Please don't let this be the last baking recipe post this year? 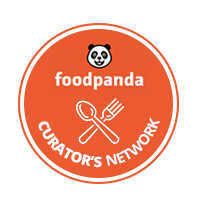 I have bookmarked your site because I love reading about the recipes you have shared. Just a quick question about the chilling of cooking dough - how long did you keep the dough inside the fridge? You mentioned until they've hardened up - does this mean until they are cement-like hard or just firm? I would love to know. I usually keep my my cookie dough refrigerated overnight but it does not become hard. This is a good idea. It is so hard to look for healthy and at the same time yummy food. So this is good to know. Happy baking! Switching to healthy options is kind of stressful particularly if you are making your own version. It sure will need a lot of trial and error to perfect it. Anyhow, glad that you made this. AT least, if you'll try next time, you know what to do to correct it. I actually don't know how to bake so when you mentioned it's crackly and crisp, I want to ask how it can be chewy. That's something I look forward to in eating chocolate chip cookies. You've definitely have a great liking to this craft. I can imagine the frustrations of not getting the right sweetness/texture and you've honestly shared what's not to expect on this product. So, it's one strikethrough to the tons of possible sources of error in baking choco cookies. I think I will always stick to my chocolate chips in my cookies! Haha! But I'm intrigued does the sugarless sugar actually taste like sugar?? If so that's amazing and something I would be very much up for trying in my baking. Such a pity about the cacao sweet nibs but everything in moderation and a few is of real chocolate chips isn't going to harm you too much! look great and tempting.. might consider to try your recipe in making kuih raya, thanks!